Sushi–if you are new to it–is a food imported from Japan, usually consisting of seafood and cooked vinegared rice. The part that gives most people pause is the fact that much of the time, the seafood comes raw. But once you get over that, you’ll be positively dazzled by the sheer variety of forms sushi can come in. Different fish, different names, all delicious! Unfortunately, unless you know Japanese or are intimately familiar with sushi, you’ll probably spend more time puzzling over the menu than enjoying your food. That’s where olisolois’ Sushionary app comes in. 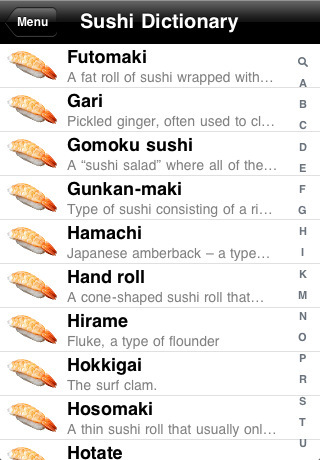 Like its name suggests, this app is a sushi dictionary. It comes with two methods of searching: by name or by pictures. Tap on Dictionary for the former, Gallery for the latter; both are arranged alphabetically. The Dictionary also contains a keyword search feature, so you can whittle down your options to anything that contains ‘tuna,’ for example. Use the alphabet bar along the right to skip to another letter. Tapping on a specific entry will expand it into its own page. There, the Japanese name of the sushi will be displayed (in both kanji and hiragana), along with a photo and an explanation of the ingredients/presentation. The Gallery is exactly like the Dictionary, except with photos to scroll through instead of names. This can be very handy in identifying the strange roll on your plate. Tapping on the photo will expand the entry in the same way. I love sushi, but a connoisseur I am not. I can’t tell you what fish is on the rice (unless it’s salmon), or what ingredients go in a Dynamite Roll. But for only $0.99, I can take Sushionary along with me to take the guessing out of the game (or from harassing the waitstaff). I adore the clean way this app was designed, and the obvious care taken while choosing photos. There’s not really much you can do to make a mistake using Sushionary, unless your sushi chef is really avant-garde. The only additions I would make would be a pronunciation guide (although, to be honest, Japanese words aren’t really that hard to say) or more sushi entries (I’m not sure what amount of sushi variety Sushionary covers, but it’s hard to think it completely comprehensive). As a bonus, 25% of all proceeds will go to Red Cross to aid in earthquake relief efforts. Really, there’s no reason you shouldn’t try this app out if you’re even remotely interested in sushi. 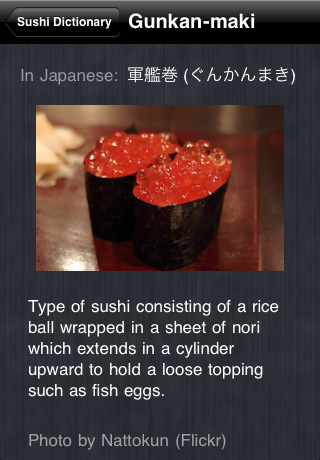 AppSafari review of Sushionary was written by Julie Guan on June 9th, 2011 and categorized under App Store, Asia, Food, Reference. Page viewed 5051 times, 1 so far today. Need help on using these apps? Please read the Help Page.